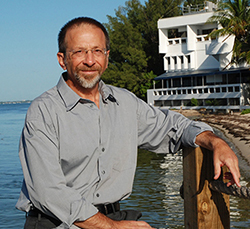 Triggered by the needs to adapt to higher education in the 21st century, many remarkable changes have taken place recently at the Rosenstiel School of Marine and Atmospheric Science. Over the past few years since I became Dean of the School, we have worked quite energetically to improve our infrastructure and to implement transformative changes to poise the School as a leader in research, education and services to the community, as an integral part of the University of Miami, which is to be “the next great American research university. The most noticeable infrastructure improvement on our Virginia Key campus, is our new 86,000 square-foot Marine Technology and Life Sciences Seawater Complex that was inaugurated on October 2, 2014. The complex includes the one-of-a-kind Alfred C. Glassell Jr. SUrge-STructure-Atmosphere-INteraction (SUSTAIN) building capable of simulating 3-D wind-wave flow and surge produced by Category 5 hurricane force winds in complex coastal conditions. The Marine Life Sciences building, also located within the complex, provides a dedicated space for the study of marine animals, the critical connections between oceans and human health and the impacts of evolving climate on marine organisms and ecosystems. This complex was made possible thanks to a federal grant from the National Institute of Standards and Technology (NIST), generous gifts from the Glassell Family Foundation, Marta Weeks Family, Vetlesen Foundation and the University of Miami. Another significant change to our campus is the demolition of our former seawater building, and where we have now started the construction of a state-of-the-art scientific scuba-diver training center that is scheduled to be inaugurated by the end of 2018. Less visible but not less important, all classrooms, our auditorium, our commons, research labs and, in general, all our facilities are being modernized and upgraded. We have also thoroughly modernized space on the Coral Gables campus for hosting the administration of our undergraduate programs, a marine science laboratory and computer classroom. Our research, education and outreach infrastructure has also been boosted by the acquisition of Broad Key, a 63-acre island located in the Florida Keys. This facility provides our students and a cadre of our world-class scientists with an ideal platform to launch field courses and conduct research that will help us to better understand Florida’s complex marine ecosystems. Another exciting addition to our research and education infrastructure is our new helicopter that has been transformed into a one-of-a-kind Helicopter Observation Platform (HOP), a flying scientific laboratory equipped with state-of-the-art technology and scientific instrumentation. This platform provides our scientists with a unique capability to obtain vital information on environmental processes and mechanisms that affect our weather and climate and impact human health. Our mission at the Rosenstiel School is to train the next generation of Earth scientists while conducting cutting-edge research and creating the knowledge that we communicate to our students and our community. With this in mind, we reorganized the School into five departments that will be able to better deliver this mission: (1) Ocean Sciences; (2) Marine Geosciences; (3) Marine Biology and Ecology; (4) Atmospheric Sciences; and (5) Marine Ecosystems and Society. We have developed new graduate and undergraduate programs aligned with these new departments, which are attracting exceptionally talented students at all levels (bachelors, masters and doctors). Our faculty and scientists continue to excel in research grantmanship as attested by the about $55M funds that we are awarded annually from federal, state and private foundations research grant competitions. We use these funds for our research expenditure, but more importantly, as the main source of income for the fellowship of our graduate students and research staff. We offer all our Ph.D. students a competitive package that allows them to dedicate their time to their study for a period of five years. This has tremendously helped in our effort to recruit the very best students – nationally and internationally. Our Ph.D. program has grown by about 50% in the past few years while significantly increasing the average GRE and GPA of each class. Realizing that the degree required for obtaining a good job in sciences today is a master’s degree, in 2011 we introduced a Master of Professional Science program with various discipline tracks. This program has been growing steadily and very successfully fulfills its mission of equipping students with the applied skills needed for the workforce. We now recruit more than 100 students in this program every year. Last but certainly not least, we are particularly proud and committed to our undergraduate programs. Starting from our dual-major degree in Marine Sciences about 10 years ago, we recently introduced five new single-major degrees that align with our five departments: Meteorology, Oceanography, Geology, Marine Biology, and Marine Affairs. We anticipate doubling the number of our undergraduate students from about 400 to 800 students. Having the unique opportunity to be on and/or in the water the vast majority of the year presents a clear advantage to our students interested to learn about the oceans and their key role in driving the Earth system. The proximity to coral reefs, our semester abroad program that includes a semester in the Galapagos (among many other destinations), our Shark Research and Conservation Program, just to list a few opportunities, all contribute to our goal of offering our students a unique learning experience. Our undergraduate programs are arguably ranked at the top of their competition. They attract the best students nationally and internationally and greatly contribute to the reputation of the University of Miami. As mentioned above, many changes have occurred in the past few years but this is far from being the end of it. Our strategic plan for 2015-2022 projects the recruitment of 16 new faculty members and we have already hired half of them in the past three years. This is also creating a lot of excitement on campus as recruitment of new talent is key to propel the School into new areas of research and education that guarantee our future as a vibrant and forward-looking institution of higher education. I encourage you to join us at the School as a student, scientist, faculty member or a friend. Our “Sea Secrets” public lecture series is a good way to learn more about us and I cordially invite you to visit us. We always have someone on campus, whether it is one of our students, a dedicated faculty or staff member, or me personally, who will be delighted to speak with you and introduce you to our wonderful School.